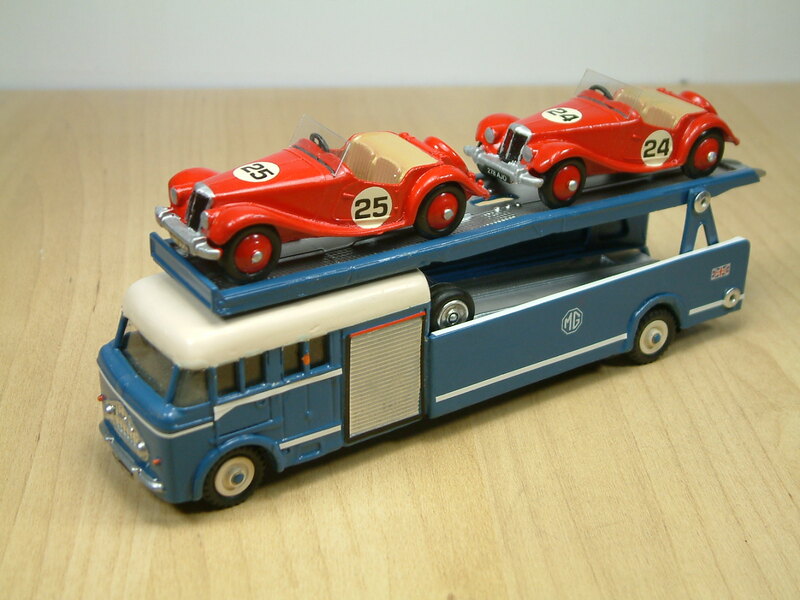 I’ve been looking of late at the amazing Race Car Transporters produced by Exoto, but much as I admire them they are well out of my price range, so I figured why not have a go at producing my own. 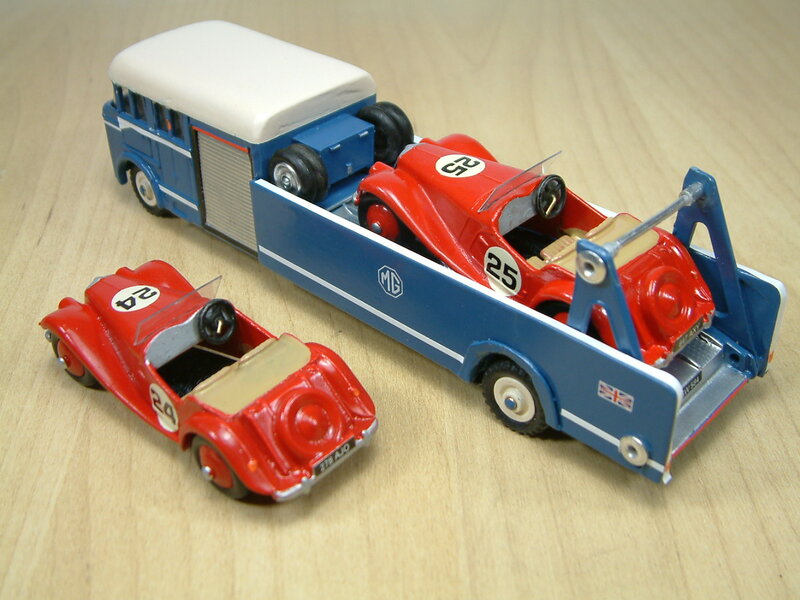 Not an exact replica of course, but something along similar lines that could complement a collection of racing transporters, and looking like it belonged in that more historic, ‘coach-built’ era of road transport. 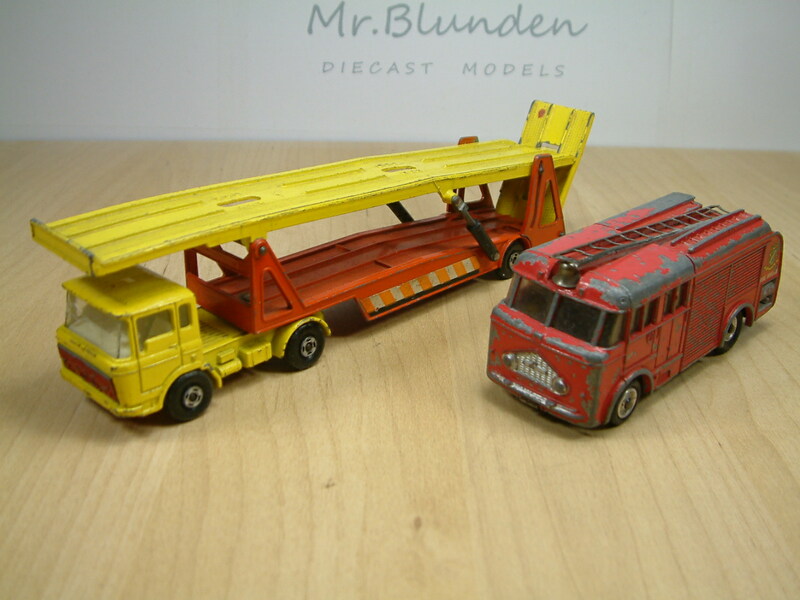 That said, the two donor models I settled on were a Dinky Bedford Fire Engine, and a Matchbox K 11 car transporter. 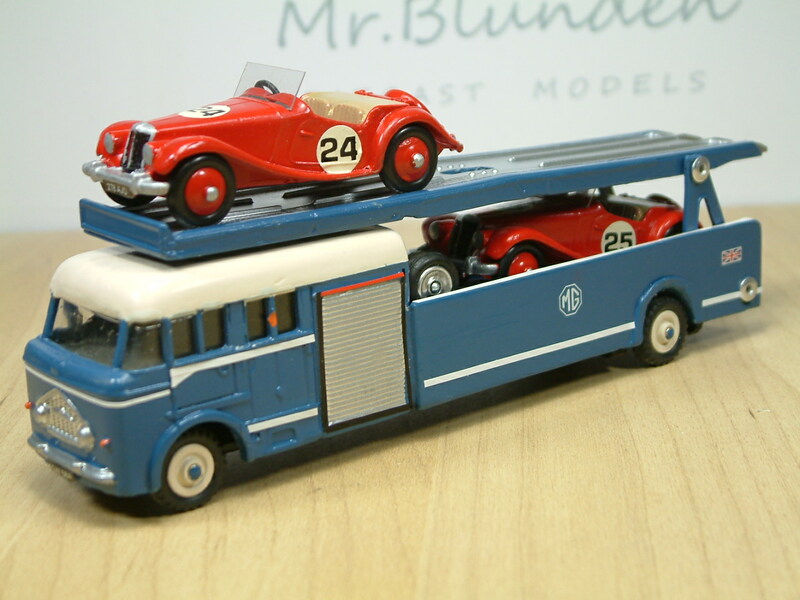 These two models are both seemingly unsought after so I was off to a good start in at least one sense, even if it didn’t work as a model, it had so far only cost half of what a poor condition Pullmore would have to buy. First step had been to get out the trusty hacksaw and see what could be made of the two of them. 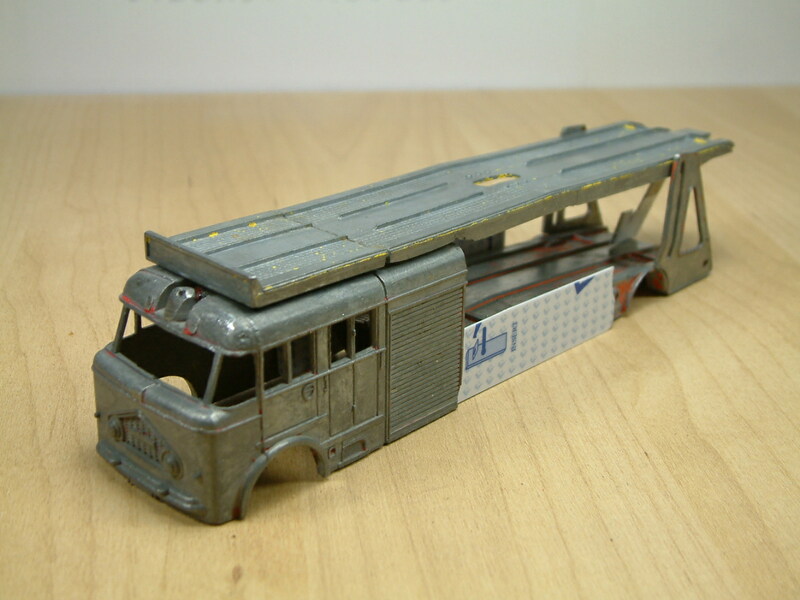 I decided to follow the line of the Exoto models and have a twin car upper deck and a single car lower deck. 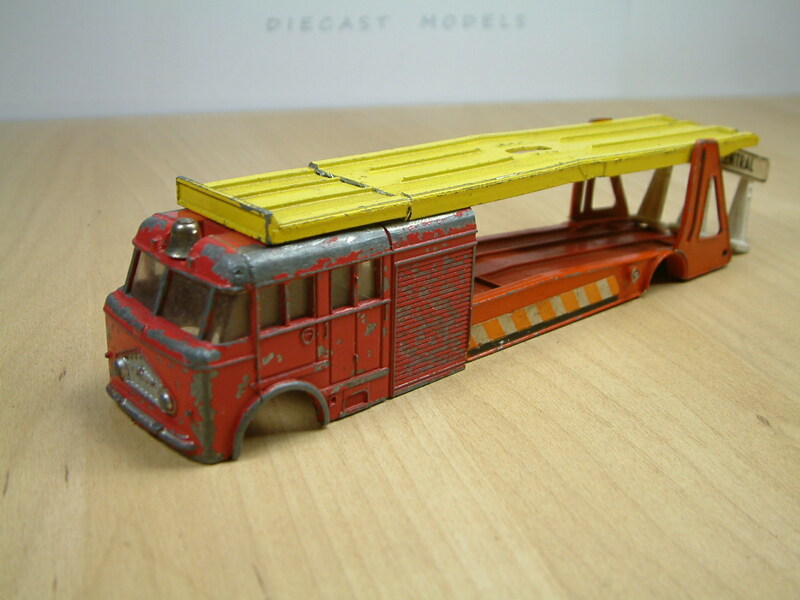 The fire engine gave a nice ‘transporter’ look to the layout, drivers cab, crew cab and shuttered secure storage area behind. 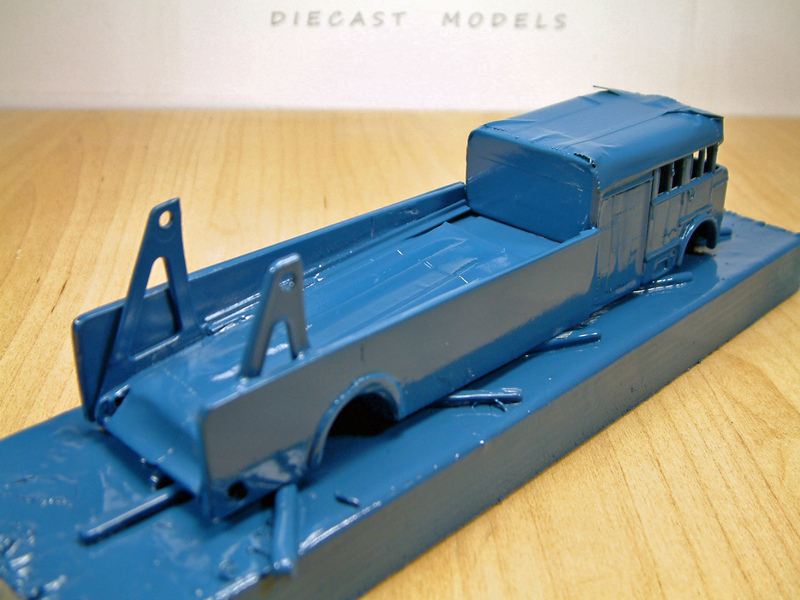 The lower deck would be to long for a single car as it had to roughly match the length of the upper deck, and so there would be room for a small work area as well. I’m still tinkering with the design at this stage. 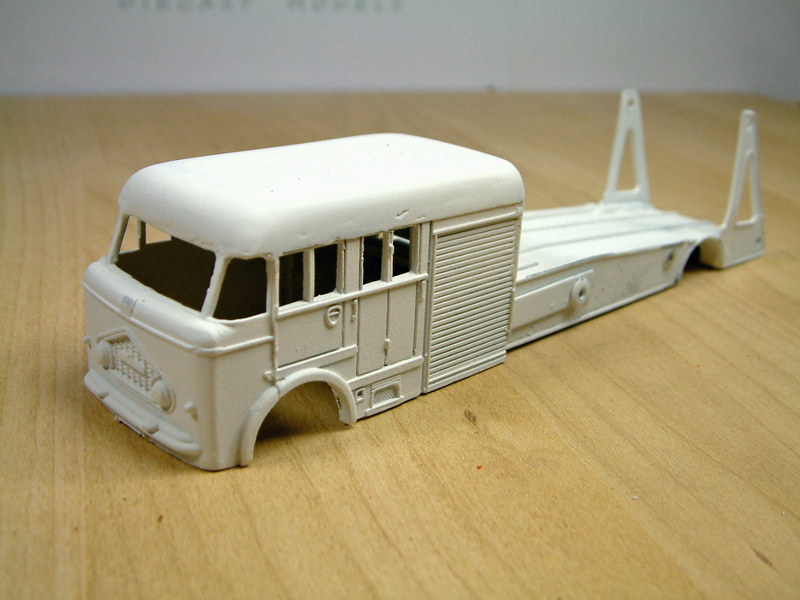 The paint has been stripped and the roof of the Dinky has been heavily filed to remove it’s fire engine past. 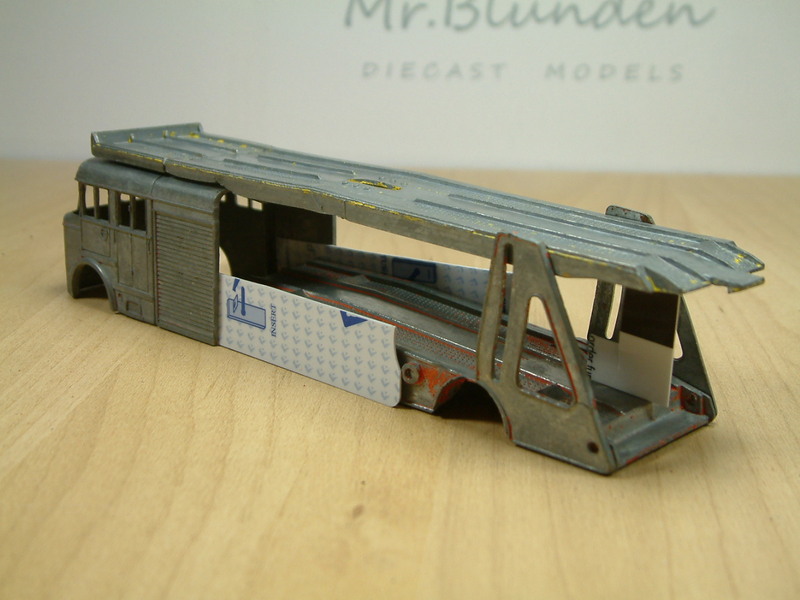 What was also becoming clear was that to fill in the bits not provided by my two donor models, I was going to need to do a lot of work with plastic card. 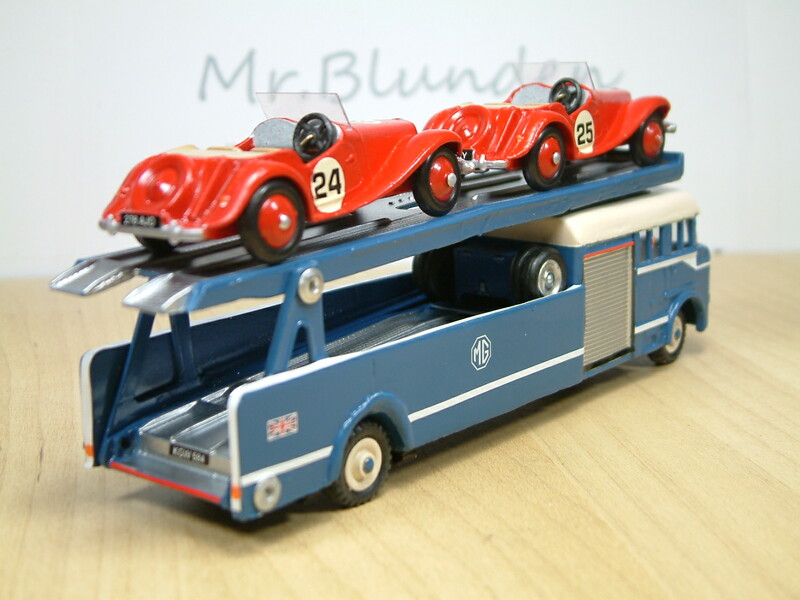 The top deck has now been shortened to a suitable length for two cars. My next big concern is how to actually join them together. 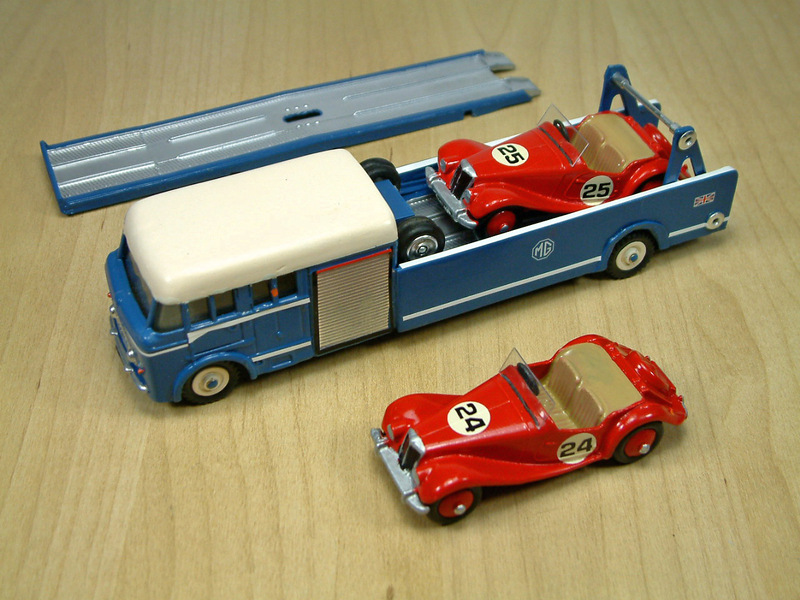 The Matchbox back is a lot thinner than the Dinky front, and when put together they don’t actually even touch. 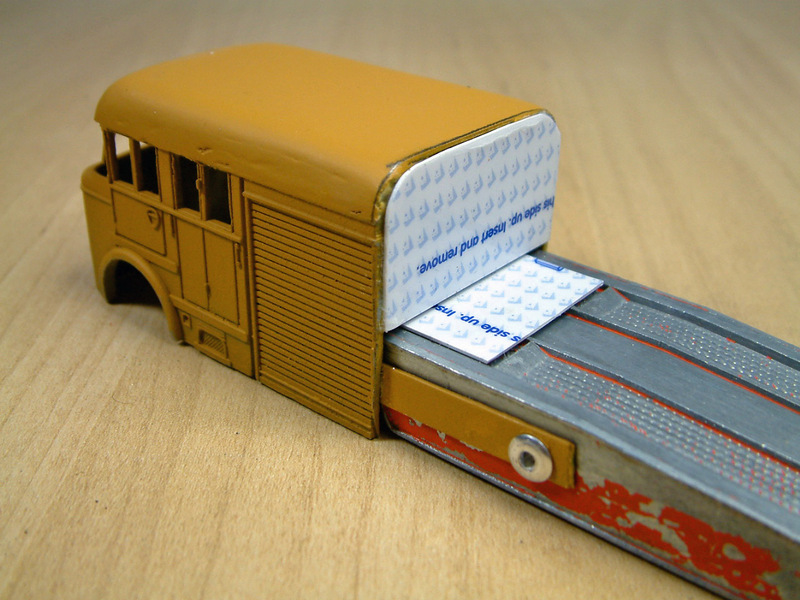 To make a strong join between the two models, I inserted two brass strips into the back of the Dinky. There was inside the model a horizontal strengthening post just behind the windows. I cut into this and butted the brass to form a right angle join. This way I only had to use two part epoxy to hold the brass in place, as the strengthening post would now prevent any up or down movement. 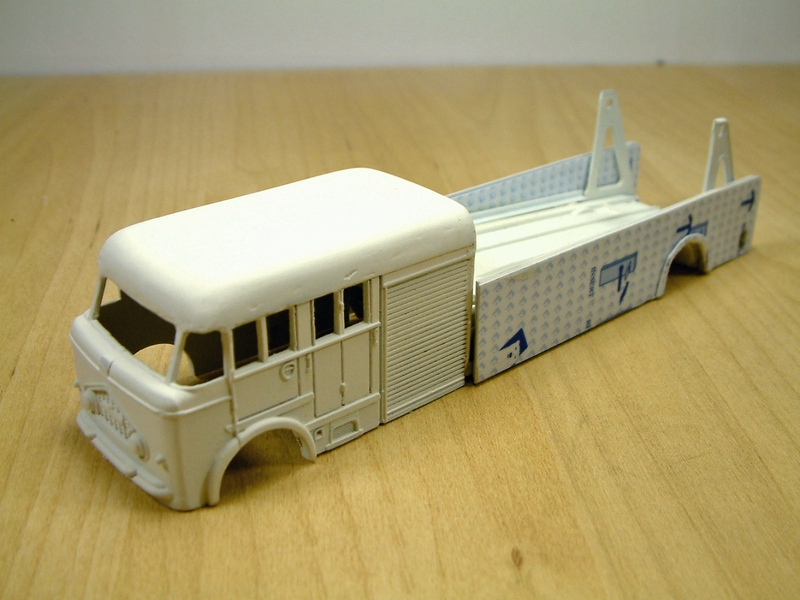 My nightmare was to complete the model and then it break at the slightest touch. A few days later now, and the hardest bit to do. I had all sorts of plans for what the rear should look like. 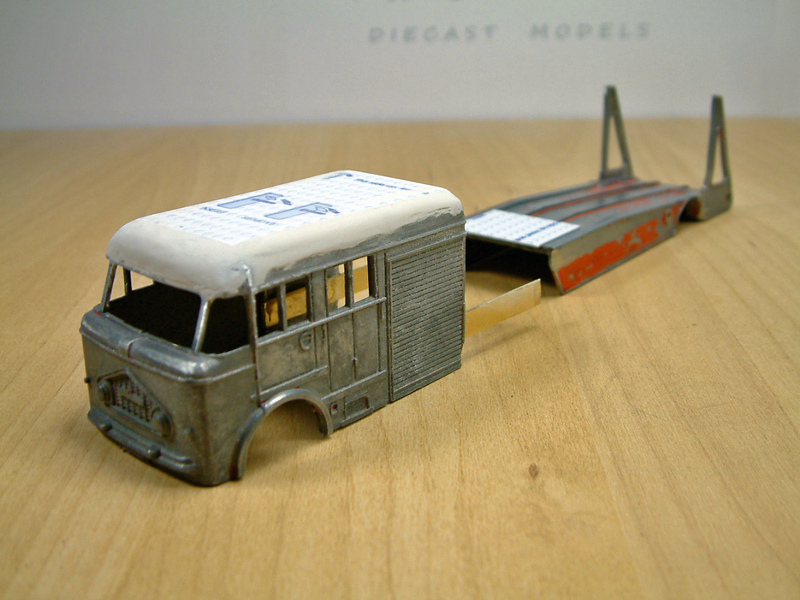 Elaborate, tall rear fins like the Dinky 985 set or a sweeping ‘C’ shape like the ‘Aerocar’ type designs. In the end though I went for a fairly plain rectangular side panel. 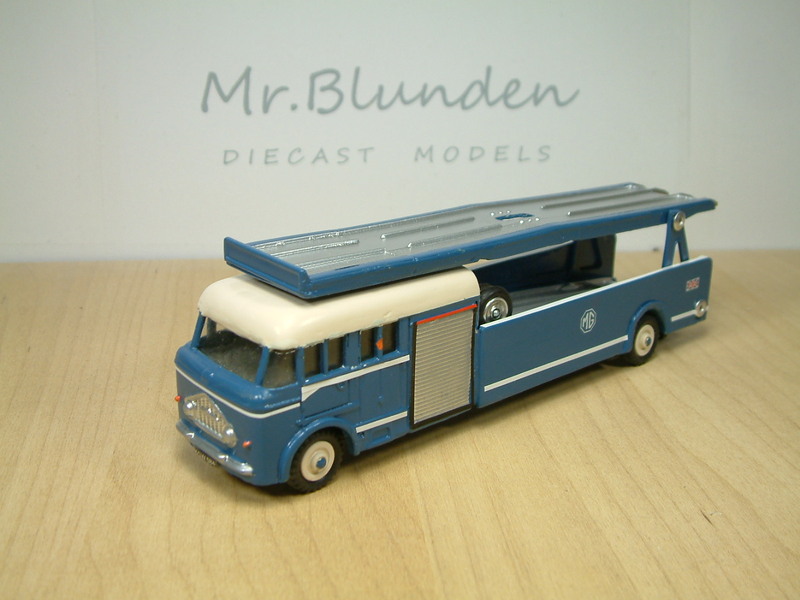 I wanted to make the two models look as one as possible, and the only line I could see on the Bedford side was formed by the bottom of the windows, so I used that as my link and continued it after the shutter area with the top of the side panels. At last the painting bit. I still had some hurdles to overcome. 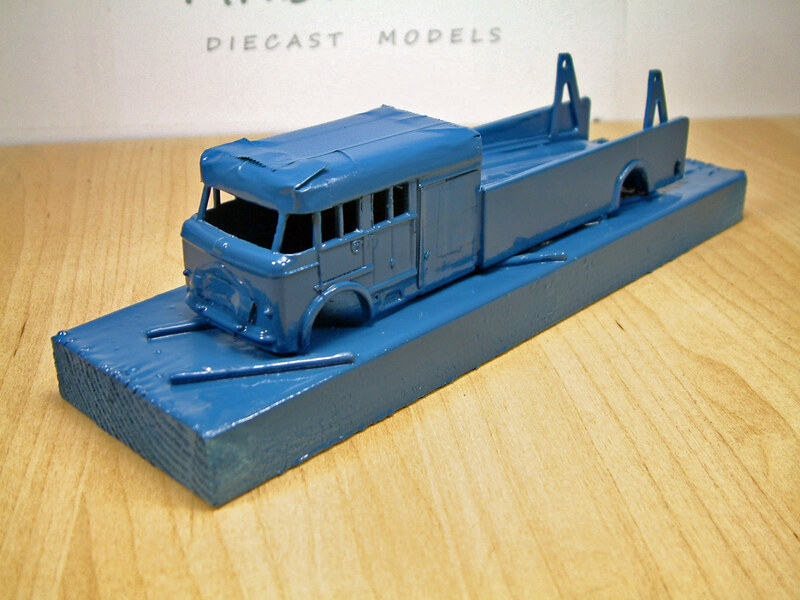 The original wheels and tires were now to small for this very stretched vehicle, and so I replaced them with Dinky Supertoy Wheels and 15mm treaded tires. The old ones didn’t go to waste though, they became the tire store on the lower deck. 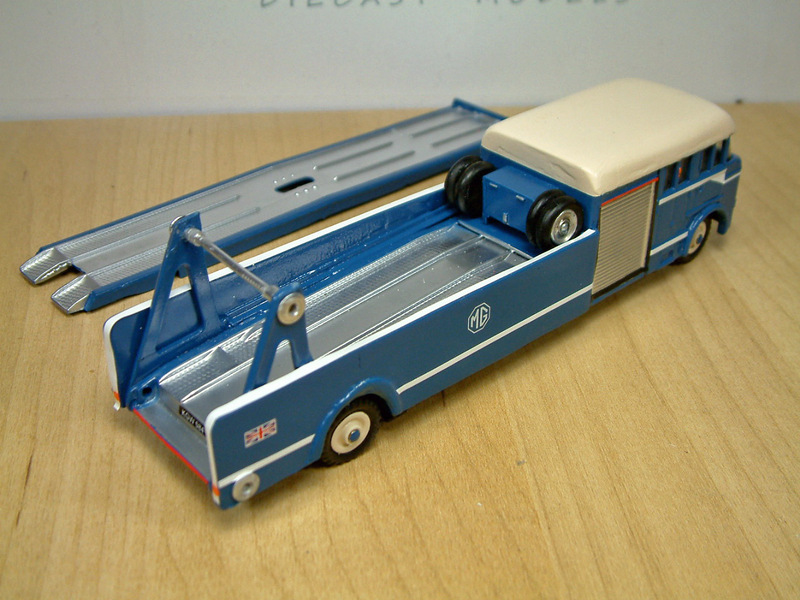 The Dinky baseplate was adapted to fit the new longer chassis, the matchbox rear axle holder however broke while I tried to adapt it, and a new rear baseplate had to be worked out. 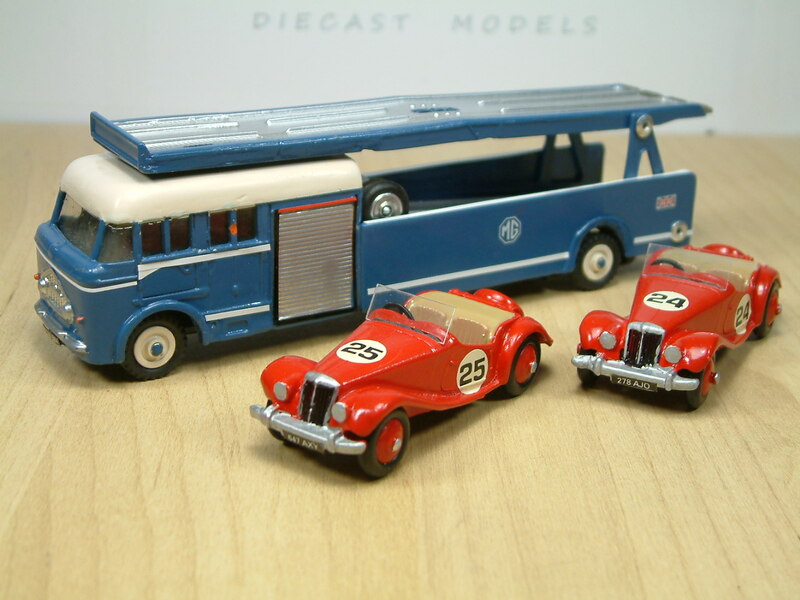 This entry was posted in From the workshop (Code 3) and tagged Bedford, Car, Dinky, MG, Morris Garages, Race, Transporter. Bookmark the permalink. 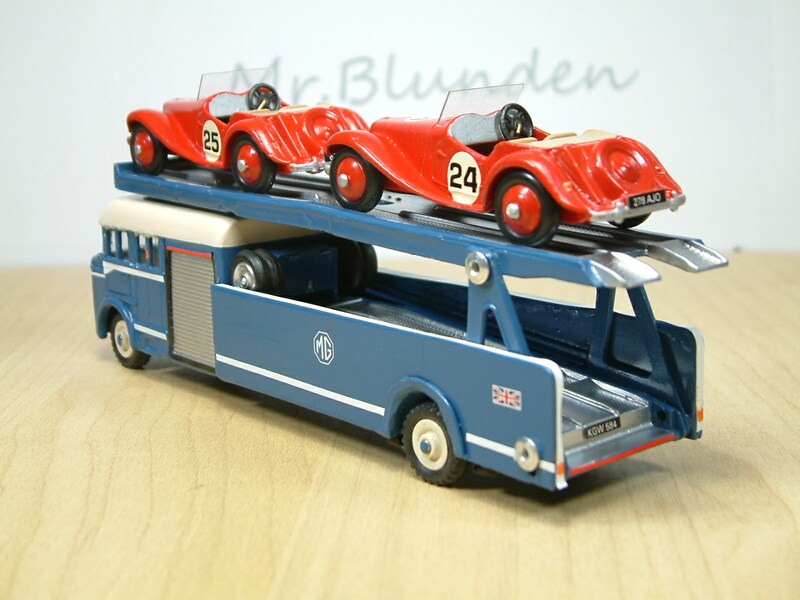 Kicked me off in a new direction than rather restoring yet another fire engine.Brilliant! Glad to hear you liked her, she was a step into the dark for me.